The consumer goods and housing sectors of the U.S. economy are on stable footing and should continue to expand moderately through at least 2018, as long as the nation can avoid self-manufactured traps, according to panelists at a trucking industry seminar on the economy. Housing and construction have not recovered entirely from the Great Recession of 2008-09 but are definitely improving. Restaurants are gaining market share from grocery stores in terms of food eaten. Car sales are down incrementally from the record levels of 2015 and 2016, and the auto and housing sectors expect millennials to start buying their products aggressively about 2020. 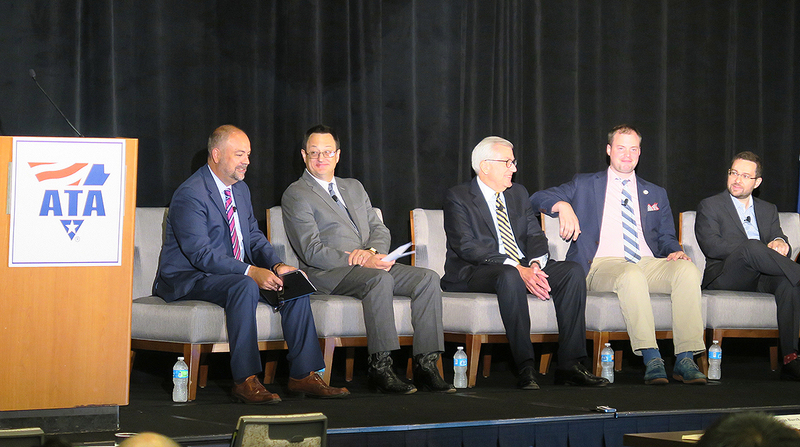 That is some of what a group of economists for trade associations told trucking executives about the state of their industries on July 20 at the inaugural American Trucking Associations Economic Summit. Consumers have benefited in recent years from growth in wages and disposable income, which correlate highly with spending, he said. To a lesser extent, the post-election growth in the Standard & Poor’s 500 index has made stock owners feel wealthier, and that also tends to increase consumption. If left to themselves, consumers would probably keep working and buying, Foster said, but unexpected interruptions are always possible. Problems with the euro currency, North Korea and the Chinese economy are examples, but they cannot be controlled by the United States, he noted. That is not the same thing as a tax cut, or tax relief, he said. While “there is nothing more the federal government can do to help the economy than tax reform,” Foster said that is not the most important job for Congress. More critical, he said, is for President Donald Trump and Congress to suspend, increase or repeal the national debt limit this fall. “Tax reform is needed, but the debt limit is a must,” Foster said. U.S. bonds have been the “bedrock of the financial system,” with nothing being a safer investment than the full faith and credit of the United States. Defaulting on the debt would cause a financial crisis, he said. ATA President Chris Spear also spoke about taxes. “Looking at what you’re able to do as far as investment — where you want to grow, where you could grow — tax reform is a catalyst to all of that. If it’s passed, that’s money in your pocket. That’s your money. It’s doesn’t belong to the federal government; it belongs to you. And you’re the best equipped to invest it in things like driver pay, safety, new equipment. Whatever your priorities are, that money belongs to you,” Spear said in his address. Steven Szakaly of the National Automobile Dealers Association and Danielle Hale of the National Association of Realtors said in their respective remarks that millennials will ultimately adopt preferences similar to older Americans. People born in the 1980s and ’90s have been caricatured as car-disdaining residents of small, urban apartments or their parents’ basements, but Hale and Szakaly said biology and demography should take hold around 2020 and the millennials will get married, start families, buy cars, move to the suburbs and buy single-family homes. “Since the end of the recession, household formation has come back in line with historical trends,” she said. NADA’s Szakaly titled his remarks on the automotive sector, “2017 — Sort of OK.” After sales of U.S. light vehicles set a record of 17.5 million units last year, Szakaly said he expects sales to decline to 16.7 million units in 2020. It’s a decrease, but it is far better than the 2010 low point of 10.4 million vehicles. Having a job and income are necessary for buying a car, but a big incentive to do so is having a child or a second child, Szakaly said, adding that he expects 2020 will see sales gains from car-buying millennials. Last year, 48% of food consumed was in restaurants, as compared with obtained from grocery stores. In 1955, he said, the split was 75% from grocery stores and 25% from restaurants. As with cars, jobs and income lead to more restaurant meals, Riehle said, as they help make easier the lives of people who are strapped for time. The way people use restaurants is changing, though, he said. In addition to traditional seats at tables, restaurants are supplying meals through carryout arrangements, home delivery and curbside pickup.